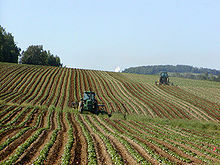 Monoculture is growing a single crop in a large area. Farmers decide what is the best crop, and grow only that. This is very common in modern agriculture, as it simplifies the farm and allows relatively few people to harvest large amounts. Monocultures have problems, however: Pests and diseases that attack only one kind of plant can spread more easily when they only find that kind. Each kind of plant also needs particular nutrients from the soil. Fertilizers are used to supply that nutrient. Farmers who don't understand farming may ruin their farm. This page was last changed on 7 March 2017, at 18:11.